At Iron Tribe Network, there are many opportunities to get involved in making a positive impact in the lives of individuals, families, and the greater community. Living values within the Iron Tribe Community is a great start! Check out the Calendar for Friday night events, sweat lodge events, and other activities. 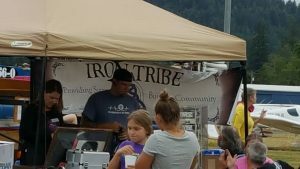 Iron Tribe Youth Network has weekly meetings and various fundraising, community-building, awareness-raising, and fun social-recreational events inside and outdoors. Check out the Calendar for Wednesday night meetings and other events. If you are a landlord, property manager, developer, or owner interested in partnering with Iron Tribe Network for Re-Entry Housing, please contact us by phone 503-344-6710 or email contactus ‘at’ irontribenetwork ‘dot’ org. Volunteers are greatly appreciated and critical to achieving the organization’s mission. Whether in the office, the courtroom, the capitol steps, the great outdoors or even remote networking, there is a place from which your services can make a positive difference. Volunteering is a great way to meet people, sharpen your skills, build a resume, and make an impact on the issues at hand. We have a signup list for court-supporters, as well as special events like Hands Across the Bridge in September, Recovery Month, each year. Leadership is also important and we have a volunteer Board of Directors that welcomes new members, as well as an active Council. If you have a story you want to share that illustrates the need and impact of mission related issues such as housing, peer support, family support, community activities, etc. let us know. Maybe you have ideas on how to improve systems and services, community response, resource management, etc. Informing our state and local leaders, policymakers, administrators, candidates and other stakeholders is a huge contribution and they need to hear from people like you. We may be able to assist you in that process. Advocacy is an ongoing process. We also do out-reach and in-reach events year-round. If you would like to get involved with these, let us know. Monetary donations are accepted and other gifts generally welcomed. Contact our office at 503-344-6710.